SenoraChase January 17, 2018 November 27, 2018 Let's play! Pop Up is my favorite game of all time! Zero prep! 100% Engagement! Differentiation! Wait time! And the teacher sits down to play…great when the teacher is exhausted. It can last 10 minutes to 45 minutes…. a perfect last activity to fill in no matter how much time is left in class. And the best part….it’s all COMPREHENSIBLE INPUT! Without further ado… POP UP! To set up: Grab a vocabulary list, print out this form and number your students. Divide the class into two groups (just draw an imaginary line down the center of the classroom) and number the students so that on each side of the room, there is a number 1, number 2, number 3 and so on. (So two students are assigned number 1, and they are on opposite sides of the classroom). In a classroom of 30 students, you will have 1-15 on one side of the room and 1-15 on the other side of the room. They do not need to sit in order, they just need to remember their number. If you have an odd number of students, just assign 2 numbers to one student on one side. Pro Tip: The easiest way to assign numbers is to have everyone stand up, and as you point and say a number, they sit down. ALSO….ever so slyly, be intentional as you match up students of like abilities. This game works best when your highest students have the same number and your lowest students have the same number, because they will compete against each other. Once everyone has their numbers, run through the line up and have students raise their hand on their numbers, just to be sure everyone remembers their number and so the teacher can jot down on the score sheet which numbers are the high flyers and which students need a bit more support. I just write a L or a H above their number on the score card, which only the teacher sees. Visual Learners, here’s what it looks like! To play: Teacher says a statement in Spanish, repeats the statement several times (giving everyone a chance to think about it’s meaning) then calls a number. Both students who are assigned that number stand up (really, POP UP, hence the name!) and translate it out loud in English. The fastest one earns the point for their team. The teacher makes a mark on the score sheet indicating which student was called (so all students get called the same number of times) and records the point on the score card. Then the teacher says a different statement (slowly, several times!) calls a different number and those students race to translate the statement. Since I can tell which numbers are high flyers and which ones struggle (because I jotted down H or L on my score card) I adapt my statement to the number I will call. Of course, at the then of class, the team with them most points wins and they bring me their stamp sheet for a stamp. Using the Score Card: You can play POP UP twice, with 2 difference classes on one sheet of paper. To just play once with one class, just use the top numbers and one square. You can see my Hs and Ls above specific numbers to remind me if I should say a more challenging statement or one with lots of cognates 🙂 First cross off the numbers that do not have a student. In this example, I only used numbers 1-11 because there were only 22 students present today. As the teacher calls a number, mark the number called. (I do a forward slash, the first time through) Once all the numbers have that mark, do a different mark to indicate it’s the second time the number has been called. (I do a backslash the second time.) Once all numbers have been called a second time, make a different mark. In this example, I started underlining, but we did not have enough time to finish, so only a few numbers are underlined. Of course the team with most points is the winner at the end, and in my class, that means they bring me their stamp sheet. Before you begin, remind students There is ONLY ONE Judge, the only person who went to college for this. I HATE it when students argue with me, especially in this game. He was faster! No, she didn’t say it right! ONLY ONE JUDGE, people! Variations: Of course you could play this with a single word. I also like to play it with questions. In my Spanish 4 class, I like to ask questions about Gran Hotel (the wildly dramatic Telenovela that we’re watching and discussing) and they answer in Spanish. ¿Cómo se llama el sinvergüenza de la familia que se mete en muchos líos? Did I totally over-complicate a simple game?! 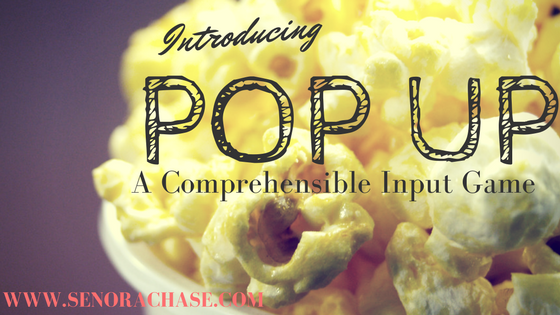 It’s just because POP UP is so great that I really really really hope you love it too! Let me know if you have questions! I’m really interested in this, thank you! Q: When the students pop up, they are both blurting the answer in English? Do you find you can usually decipher their replies accurately? Kids have such a keen sense of justice– Do you find that it’s not usually difficult to hear and decide? I’m not sure I trust myself to decipher since my ears are getting old and it’s usually the tiny words they mess up on. What leeway do you give for small mistakes, like LA niña comió la pera = THE girl vs. A girl? I totally get the reminder that there is only one qualified judge!! 😀 t.i.a. Haha…yes, set it up and remind them, THERE IS ONLY ONE JUDGE! I also tell them, that if I DECIDE that it’s too close to call, I’ll announce “Rock, Paper, Scissor” and they will play to determine the vote. That way, you don’t have to decide which one was faster it it’s soo close….just let fate decide it! Rarely they will say it exactly at the same time and I can’t tell what they said, so I’ll ask one to repeat exactly what they said and I’ll ask the other to do the same, then I will award the point. Good luck! I hope you love POP UP as much as we do! It’s so fun!